An Analogy Between a Consultant/Coach and Paratrooper. Information and Adaptability is Key! I believe there are certain analogies between being a Paratrooper and being an Agile Coach or Consultant, including having strategic objectives, a purpose of infiltration, a sense of opposition, and a goal or cause that you believe in. However, I am not asserting that, a) implementing Agility at an organization is a declaration of war, b) Agility is a tactical warfare technique, or, c) being an Agile Coach or Consultant is synonymous to or nearly as dangerous a job as a Paratrooper. Having said that, depending on the environment an Agile Coach or Consultant may sometimes feel like they are actually entering a corporate or political war zone. They are often viewed as outsiders posing a clear threat. They are often in the minority. They are often dropped in to unfamiliar territory. They often have incomplete or incorrect information. They are often surrounded by opposing forces. They are often made a target, either passively or aggressively. They often start with plans, but what makes them successful is their ability to adapt their plans and react to situations. In other words…be agile! 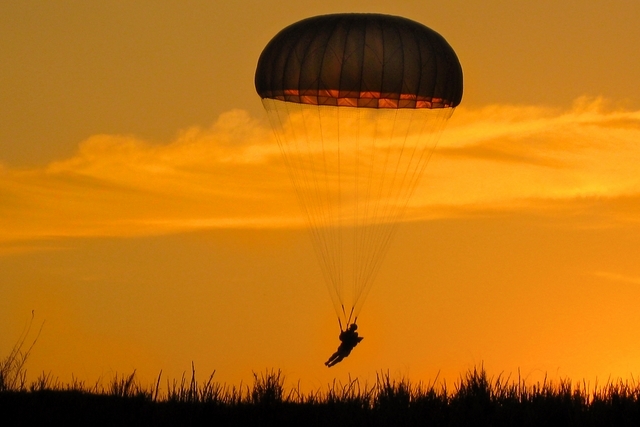 Like a Paratrooper, a Coach or Consultant is often “parachuted” or “inserted” in to an organization or foreign group with a specific mission. It is often to provide a “tactical advantage” and doing so helps a Coach or Consultant “evade emplaced fortifications [well established norms or strong opposition] that exist”, so they can get the job done from the inside and with less opposition. A Paratrooper should always enter the field with a good understanding of the landscape, environment and situation. Similarly, a Coach or Consultant should also become familiar with the working environment and culture they are about to interface with. Without critical information both would risk the success of their mission and perhaps more. For a Paratrooper a lack of information could be life threatening, but fortunately the threat is not usually life threatening for organizational change agents. It just might be professionally damaging to their career as well as others and their business. To that effect, I believe if you are a Coach or Consultant then you should still perform advance research for your intended mission in order for you to be successful, provide value and create an opportunity for learning and improvement. This means you will need to have conversations with both the leadership of their target (organization) and also with the people doing the work. Here’s why. Leadership (usually the “paying customer” is management in the organization) should have specific and measurable outcomes they want achieved, and it is critically important for you to identify what those are up front and how they are expected to address their business problems. Meanwhile, the employees (usually the workers or teams) are often directly associated with and intimately familiar with the true needs and system issues, so you must also become familiar with their understanding for perspective. Unfortunately, the first battle is often that workers and their leadership do not align on their expectations and outcomes, and without their alignment you have little hope of true customer satisfaction and helping them collectively solve their real business problems. As such, to manage expectations and increase chances for success it is critically important for a Consultant or Coach to investigate and identify both the needs of the leadership AND the needs of the employees, and then work to align them before any substantial work takes place. The best approach is to have face-to-face conversations with all the leadership and employees but that can take considerable time in a larger organization. So how do you get a realistic pulse of the company without talking to absolutely everyone? If the team(s) are using Scrum as a framework then one option is to use a Scrum team assessment tool like Scrum Insight. This tool provides objective coaching advice tailored specifically to a Scrum team as it is designed to detect how aligned the team is to Scrum practices and methods. The free version of this tool provides access to the basic report which contains the team’s overall scores, a “quick win” recommendation that identifies and provides suggestions that can be made to provide the biggest improvement on the team, and a list of support resources. The paid service provides everything in the basic report as well as a detailed Scrum Score Card, a Team Environment Score Card, a relative industry ranking, other education and support resources available for consideration, and it is usually followed up with a personal call to provide you with detailed explanation on the results. 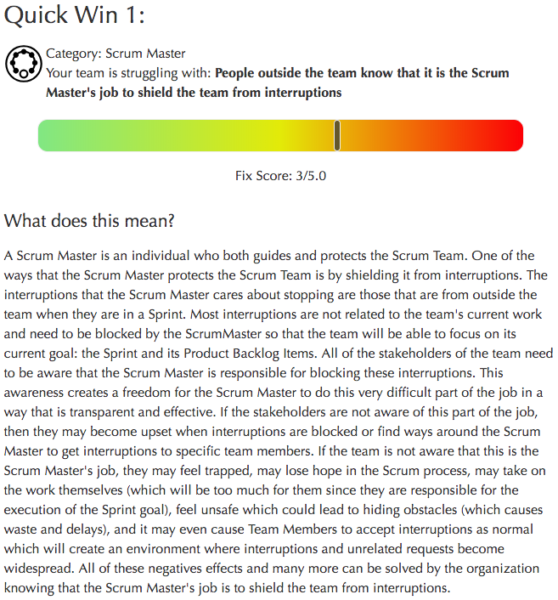 Here is a sample Quick Win Report from Scrum Insight A more detailed description is provided in the report, and it is tailored to the team’s specific challenges and opportunities. 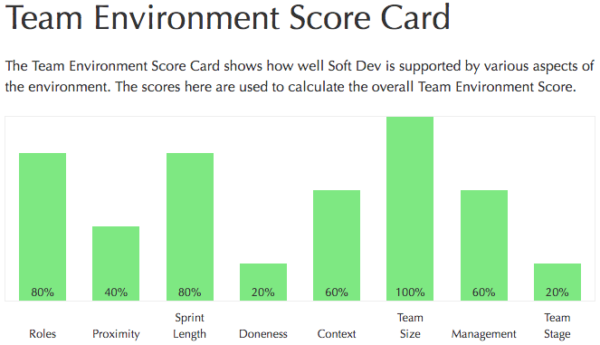 If you would like more information, you can also view a full sample report from Scrum Insight. Another option is to conduct a REALagility assessment – either for a team, a group or an entire organization. The assessment is a 10 minute online survey conducted by every individual, and it is designed to uncover the misalignments between what leaders think and what employees think in an organization. The resulting report reveals the soul of the current culture, and it is grounded in real, actionable data to improve on the problem areas unique to the organization. As a Consultant or Coach these insights can be invaluable in helping you prepare for the engagement, identify opportunities, create alignment, and elicit real, meaningful and sustainable change for the organization. Here is a sample diagram from a REALagility assessment, showing the relative rankings for an organization around five cultural measures. 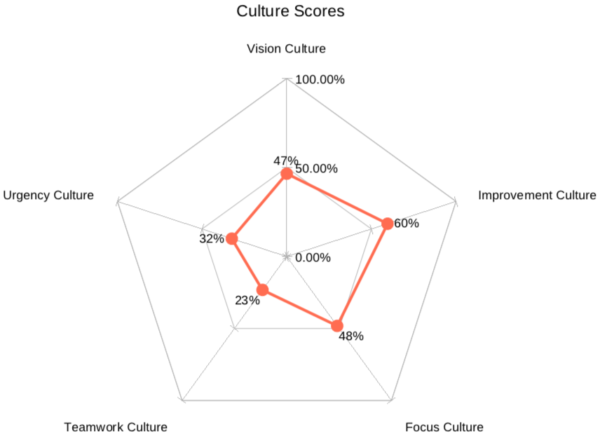 Detailed descriptions and insights for each cultural score are provided in the report. In summary, I find it immensely helpful to “arm” myself with information prior to a Coaching or Consulting engagement, and these tools have been pivotal in filling that gap. Having early access to information such as this enables insights that might otherwise not be detected until I am on the ground helping the individuals, teams, and leadership tackle their business problems, which saves time, frustration, and money. An additional advantage with leveraging these electronic evaluations is that they provide an opportunity for people to provide ideas, feelings, agreements or disagreements that they may hesitate to share in a face-to-face interview. There are certainly other tools that are designed to provide insights and information, but I’ve chosen these two because of my familiarity with them, and because of their effectiveness. Of course, I would never replace good, valuable conversation with tools or data, but I do find these tools provide additional contextual information that further enables me to ask the right questions and have the right conversations early in an engagement. Finally, these tools can also be used as a benchmark for comparison of progress after a period of time has elapsed, which allows you as a Coach or Consultant to measure and be accountable for success.